Frank Boardman Eaton was born in Connecticut in 1860. He lived for 98 years, dying in 1958 when I was 13 years old. He lived in Perkins, Oklahoma from the age of 30 until his death. My sister, Peggy Watts Gattenby, was a friend of his granddaughter, Nola Wise. She spent time in their home and visited with Eaton. I recall being in awe of the diminutive old west cowboy who would walk the streets in full regalia of cowboy clothes with six shooter hanging off his right hip. When he was eight years old, Eaton’s father, a former Union soldier who had moved his family to Kansas, was gunned down at his home. His murderers were six former Confederate soldiers who were described as renegades and members of a group known as the Regulators. Young Frank witnessed the murder of his father, whose friend and neighbor, Mose Beaman, gave advice to the eight year old that we would find unusual today. With those words, the gift of a pistol and holster, and some initial training on the use of the weapon, Beaman set the young Frank Eaton on a path to seek justice for his father’s murder. At fifteen, he showed up at Fort Gibson where the 6th Cavalry was located. In pistol competition he outshot everyone. The Commander of the Fort, Colonel Copinger, was so impressed that he told Eaton, “I am giving you a new name. From now on you will be known as “Pistol Pete,” and so he was. 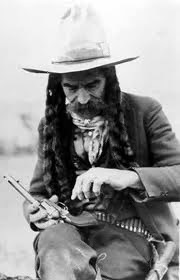 By 1887, Pistol Pete had tracked down and killed all of his father’s assailants but one. That man, John Ferber, was shot and killed in a poker game the night before Eaton arrived to kill him. He attended the man’s funeral to ensure that he was dead. Frank (Pistol Pete) Eaton became a U.S. Marshal at the age of 17. The first five notches he carved into his pistol grip denoted the execution of each of his father’s murderers; he added six more during his time as a Marshal. In 1889 he settled in Perkins, married and became a blacksmith. He also served as a Payne County, Oklahoma deputy sheriff. 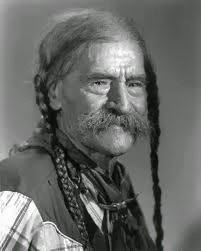 Until his death, he always wore his long Indian style braids, a pistol displayed on his hip in a quick draw holster, and his frontier era western clothes. In 1923, after Pistol Pete rode in the Armistice Day Parade in Stillwater, Oklahoma, students from the local Oklahoma A&M College, asked him to become the college’s mascot. It seems the students were dissatisfied with the then mascot, a tiger. They believed it did not adequately portray the Oklahoma A&M spirit or image. 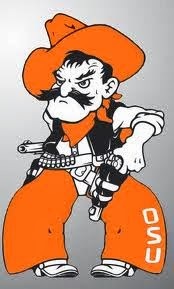 Of course, Oklahoma A&M College later became Oklahoma State University, but the “Cowboy” mascot never changed. Pistol Pete roamed the sidelines at the University’s football games for several years. One of his last public appearances was in 1957 riding shotgun on a stagecoach during half-time homecoming festivities. The cartoon OSU Cowboy is a caricature of the old lawman and cowpoke. 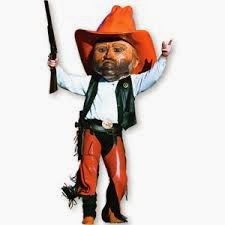 The current mascot with the gigantic cowboy head who now prowls the sidelines of ballgames is also a reminder of the real Pistol Pete. 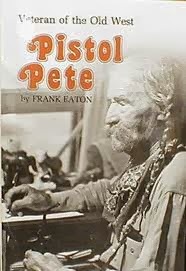 Frank (Pistol Pete) Eaton lived at a time when he could bridge the gap between the old wild west and a modern world. As a boy he was expected to personally exact revenge for his father’s death. As an adult living in an era of airplane travel, moving picture shows and college campuses, he embraced the change. Pistol Pete tried it all. He was a cowboy, lawman, killer, husband, father, grandfather, celebrity, story teller, newspaper columnist, author, blacksmith, and lecturer at a university campus. Because he lived in a time of rapidly developing technology and had no fear of change, we have access to audio and video recordings of Pistol Pete. After reading this story, you will be short-changed if you don’t click on the links below and spend a few minutes hearing Pistol Pete tell you in his own voice about going after his father’s killers, seeing film of him showing off his quick draw and waving good-bye to us all in a home movie. If you enjoy these weekly stories, check out my writing at Amazon.com or here on my website. Thank you! PIstol Pete was quite a character. Larry, thank you for sharing. I wish you the best in your endeavors, although I miss your tenacity at the bargaining table. Take care of yourself. Thanks, Doug. Those were great times! Some of my best friends, including you, have come from Galveston P.D.